We're pleased to share our latest project with you: a new look and a new website for Goochland County Economic Development. Goochland is a dynamic and growing rural community in central Virginia. The county is located just 13 miles west of the state capital, Richmond. Washington, D.C. is within a two-hour drive. Goochland is home to a diverse and prosperous business base that includes major employers such as Capital One, CarMax, Luck Stone Corporation, Performance Food Group, and Virginia Farm Bureau. 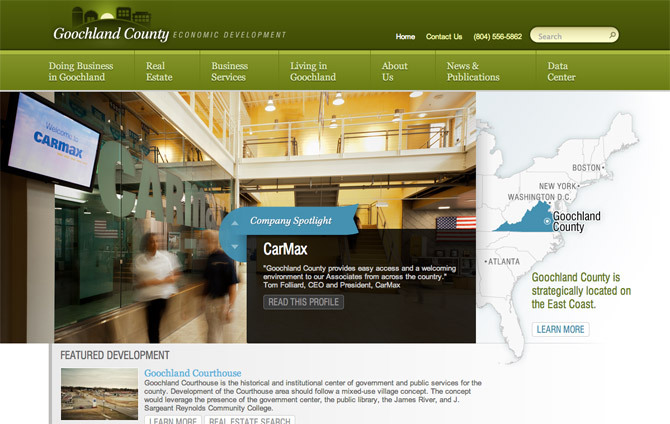 This is the county's first economic development website. Economic development staff wanted a website with pop and polish, a website that would ultimately give them a competitive edge when talking to site selection consultants and prospects. The new website does exactly that. Now, the website plays up the character of the county and its business community. A bright color palette pays homage to the bright, open spaces the county's known for, as well as the bright and growing economic landscape. Photos and testimonials from local business owners give the county a distinct voice, and paint a picture of Goochland’s key assets and strengths. Content has been updated and reorganized, making it easy for visitors to find all the information they need, quickly and efficiently. Featured real estate listings, where Goochland County Economic Development can highlight different sites and buildings. Listings include a property description, photography, and supporting documents like brochures and maps. A searchable property database, which pulls in and displays real estate listings from the Virginia Economic Development Partnership’s “Virginia Scan” real estate system. The County’s GIS map, which is “framed” within the economic development website. Visitors can get to this tool in “one click” – they don’t have to leave the website. Critical research and documents are housed within a central “data center” hub on the website. Website visitors select the document(s) they need and generate a custom report, which is available to download as a PDF. The economic development website is on a custom content management system. The CMS requires no special software or technical skills. Staff members can make updates at any time, from anywhere, using a user-friendly web interface. The website was developed with mobile visitors in mind. The website automatically adjusts itself to fit different screen widths, from desktop computers to tablets to mobile phones.